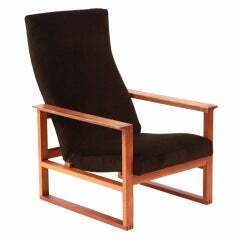 The Fuzzy Captain is a variation on Evan's faithful captains chair design. 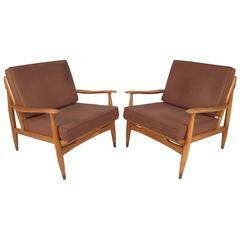 It combines bigger and beefier proportions with his dynamic design to make for an intensely relaxing sit. Evan’s original concept for this piece was to make a chair that literally felt like it was embracing you as you sat in it. The Icelandic sheep pelt backrest cushion fit that concept perfectly. Always striving to give his pieces personality, Evan chose a reclaimed oak barn beam as the wood for the chair frame to give texture, nostalgia and familiarity to this unique creature. For the upholstery he teamed up with two long time friends, the creative force behind “De Islas”, a designer textile company. They hand draw or paint all their designs and then transform them into repeatable patterns for a totally unique look that really works with the Fuzzy Captains big personality. Each Fuzzy Captain is unique, Wood and animal hides have lots of natural variation in grain and color, no two are exactly alike. Variation is the spice of life! Its what gives each Fuzzy Captain its own personality! Evan Z. Crane is a Brooklyn born designer and manufacturer of bespoke sculptural furnishings. Growing up in south Brooklyn the industrial landscape had a profound effect on him. The stark geometry of his surroundings were deeply inspiring throughout his childhood and early creative career. Drawing upon that inspiration to fuel his vision, he creates not just furniture but obsessively designed objects imbued with personality. Every aspect of a piece is derived from a vision that cannot be reasoned with. Evan will reject redesigns and revisions, always striving for the original conception. In his heart Evan believes that if he stays true to his vision, the work will not only speak for itself, but live on with its own personality, long after it has left his workshop. Still Fully immersed in the industrial landscape he produces work from his studio in the Brooklyn Navy Yard, and resides in Gowanus Brooklyn with his wife and daughter. 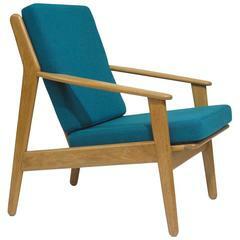 Danish lounge designed by Poul Volther crafted of a solid white oak frame, newly upholstered in a teal wool fabric. Finely restored in a excellent condition.